PUBLIC SERVICE ANNOUNCEMENT: (It’s in bold, caps letters, so you know it’s official) Hello ladies, gents, and other such creatures. I apologise for my prolonged absence, but I have hitherto been indulging in all the distractions and adventures that my new Japanese surroundings provide. Also, alas, for all the robots walking around, underwear vending machines, and real-life Pokemon, Japan has its movies coming out several decades after its Western counterparts. But hopefully with more persistent piracy, I’ll catch back up. So, without further ado, we have Warcraft: The Beginning! This movie received as polar reviews as they get. The outraged Alliance of all things pompous and critic proclaimed it a CGI heap pile of droppings, while the Horde of years-long fans roared their approval and clamoured for more. The movie, as the title so wisely tells us, takes us to where the games more or less start out: the Orcs’ first invasion of Azeroth. The Orcs’ home world of Outland is quickly dying, and the Orcs seek new lands that promise life. Under the evil rule of Gul’dan, a demon possessed Orc warlock, the Horde takes its first steps in Azeroth through the Dark Portal, a magic gate that bridges the two worlds. One of the chieftains from the Horde, Durotan of the Frost Wolves clan, worries that Gul’dan’s reign will bring nothing but further death and desolation to his people. As he and his pregnant wife, Draka, enter Azeroth, he struggles to find a path that may give his people a future. On the side of the Alliance, we have Ragnar Lothbrok, better known as Lothar, vaguely known as Travis Fimmel. He’s a noble warrior and commander, and he is charged with discovering the source behind the mysterious attacks that have been plaguing nearby posts. He is accompanied by a young exile mage, Kadgar. Having recently left the Kirin Tor, the high mages of Azeroth, he too is drawn into the intrigue of the dark invasion. He goes to seek the help of the legendary Medivh, The Last Guardian, a Magus with immeasurable power charged to protect the world of Azeroth. And so the wheels of our story start spinning. Myself, a humble half-breed, I’d have to side with the Horde. I never got around to playing World of Warcraft, but I definitely lived in Warcraft III: Reign of Chaos and Warcraft III: The Frozen Throne for more years than it was healthy. Not only were the games pure fun, with many community-made maps to keep it fresh, but it had a surprisingly well written story line that made for a very immersive and satisfying campaign. The drama was good, the characters were awesome and interesting. We had the mighty Hellscream, noble Thrall, damned Arthas, the cunning Ner’zhul, and the proud Illidan, and many more. It was a fully crafted world, with intrigue, might, magic, and war. It was any teenage boy’s world, and I am sure some girls got lost in there as well. Blizzard’s cinematics are legendary, despite the shaky success of some of their games, I don’t think any fan could ever put a hand on their heart and claim that a Blizzard cinematic was merely OK. It is then little wonder that someone put 2 and 2 together and realised that the Warcraft universe was ripe for the big screen. When I heard about this movie, I had my doubts, but the trailer, and later the viewing, quickly banished my doubts. As a fan of the Warcraft universe, you can’t help but be at awe at a full-feature cinematic. And that is more or less what this movie is. Even though it is a movie, it is still very much so one large cinematic. And it has all the strong suits of a good cinematic: gorgeous and immersive visuals, interaction of impressive characters, and entertaining conflict. This movie is almost entirely all green-screen. However, all the combat looked absolutely brilliant. I was very worried that we would just get the usual Hollywood shaky cams and poor action directing, but the movie looked every bit as good as the Blizzard cinematics in that regard. I got absolutely giddy seeing the floating city of Dalaran, the ABSOLUTELY gorgeous Stormwind, and the barren wastes of Outland. And when I saw the shrowded statues next to the Dark Portals, nerd chills were aplenty. Now, this is far from a great movie, and really, you just shouldn’t take it as such. The critics hated it because, really, without any background love or knowledge of the story, this is just one big, cheesy, epic fantasy. But as such, this big, cheesy, epic fantasy gave the fans everything they wanted and more. The battles were glorious, the landscapes and props were absolutely on point, the characters were decently acted (which doesn’t say much, but still a plus). There’s a few moments where you are watching this movie and you feel like you stumbled into a high school play written by the local D&D champion, but you just shrug it off and quickly forget about it as the movie continues to deliver so many awesome little gems that you have grown to love over the years. And as such, I think it is fair to say this movie was a success. 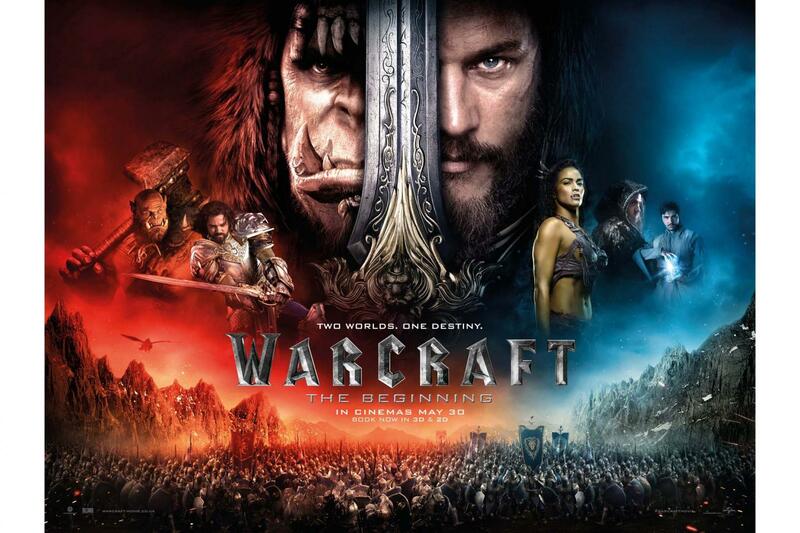 If you’ve never played or read anything Warcraft related, this flick might not be for you. That being said, if you are open to just some good old-fashioned fun and fantasy, you might still enjoy it if you remove the broom handle from your posterior. Much worse CGI pornos have come out in the past and with more critic acclaim at that. As cheesy as some of the movie undoubtedly is, it rests on the pillars of what is actually a very well crafted and written world. So even with its weak moments or three, the engaging and immersive world of Warcraft pulls you in.